Shawna Johnson* had no idea what she was getting into when she landed her first nonprofit role as an “Administrative Coordinator" at a homeless outreach program in Washington, D.C. The title “Administrative Coordinator” turned out to be a huge understatement. The actual role entailed many surprise responsibilities, and Shawna was left scrambling to figure things out as she went. As Shawna discovered: in the nonprofit world, a role often entails much more than the job description ever indicates. If you’re just starting out in the nonprofit world, a good understanding of what you’re getting into can help you pick up speed and succeed right away. 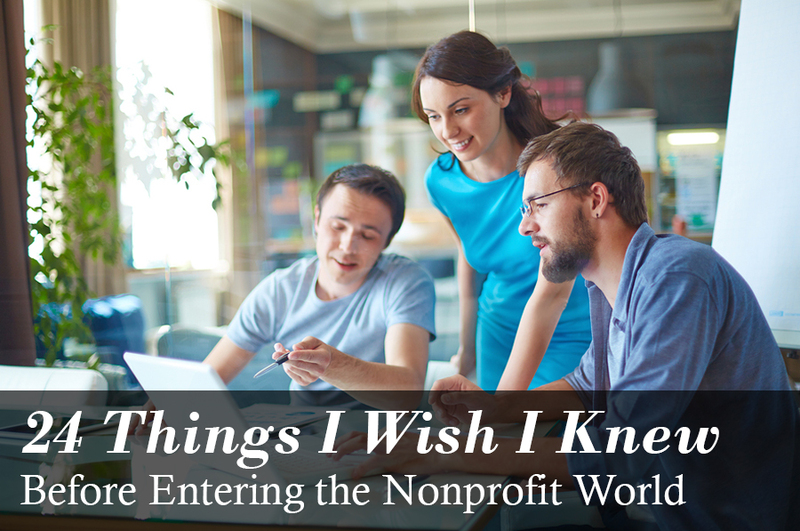 To help you out, I sought the advice of Shawna, and a dozen other nonprofit pros (many from a fantastic Facebook Group called The Nonprofit Happy Hour) about what they wish they knew before entering the nonprofit world. Here are the 24 things they hammered home. Even the most financially sound organization can go through tumultuous times. Funding sources, policy, and conditions can change quickly – affecting organizational priorities. Being comfortable with career ambiguity is key for comfortably working in nonprofits. Nonprofit work is known for its mission-driven core. Sometimes achievement comes with pushing yourself and your team to its limit. Flexible, lifelong learners who can take on multiple roles are ideal candidates for nonprofit work as job descriptions change as quickly as the weather. Many people thinking about working at a nonprofit are worried about the salary. When you begin your search, make sure you understand the financial footing of the organizations you’re interested in working for and manage your income expectations accordingly. And don’t forget, even if it is your first nonprofit role, you still have the opportunity to negotiate your salary. Many people believe nonprofit work is low-paying, under-resourced, time-intensive, hands-on-helping-people work, or spending all day at luncheons with the upper crust asking for donations. But, from the International Red Cross to a local membership association, the nonprofit sector is as diverse as they come. Some nonprofits are chaotic and fast paced, while others are structured more like corporate jobs. Either way, don’t make assumptions about working for “nonprofits;” instead, get acquainted with the diversity of opportunity in the nonprofit world and do some research on your target organizations through salary and employee review sites, like Glassdoor. Belief in the nonprofit mission is important, but understand that the mission of the organization and the internal culture can be vastly different. “No matter how much you love dogs and cats, working in an animal shelter may not be the right choice for you if you aren’t comfortable with some of the practices associated with reducing pet overpopulation,” said Holly Harper, a former animal care tech at the Oregon Humane Society. The same is true for the culture of the organization — seeking to work in a traditional humanitarian nonprofit may seem like a perfect fit for your passion of international development, but a large, bureaucratic organization may move too slowly if you’re geared more toward a startup setting. Assess both the organization’s practices and internal culture to make sure you’ll feel comfortable on the team. In 2016, when the Obama administration implemented new overtime pay policies, many nonprofit organizations pushed back. Why? Because nonprofits are known for maximizing return on investment in resources — from welcoming free labor (volunteer! ), welcoming free goods (donate!) and capitalizing on the “passions” of their mission-driven employees. From paperwork to bureaucratic red tape to funding woes to salary cuts, the nonprofit world can be ripe for burning out employees. Remember: work is just work sometimes, and you need to take care of yourself, too. If you want to advance your nonprofit career, start pushing yourself out of your comfort zone from Day 1, and develop a thick skin. Start with figuring out which sector of focus you’re specializing in, and find an organization to help you with further training through online courses, seminars, or by taking part in more casual learning opportunities, like reading blogs or listening to podcasts, or webinars as you have time (here are some great nonprofit webinars to get you started). More formal training, such as university programs in nonprofit management, or professional nonprofit designations, are something to consider as well. Whether it’s an online community, a co-worker, a membership organization, or using your board to network your way into a traditional mentorship, find a mentor (or more than one. Start with following these nonprofit experts on Twitter to get a regular feed full of great advice. Unlike the for-profit world of dollars and cents, working in nonprofits means explaining what a donor’s return on investment looks like in terms of impact and change. Being articulate, passionate, and convincing are skills any nonprofit leader should build. Look up your local Toastmasters organization, an international club for improving your communication and public speaking through supported practice. Fundraising, grant writing, marketing, volunteer management – there are dozens of specialties inside of the nonprofit sector, depending on how large or small an organization is. If you’re focused on fundraising and event planning, but aren’t cut out for grant writing, be sure to choose the right size organization to suit your goals. From working with the board to volunteer management to fundraising, building relationships is everything. Who you know, how you manage your relationships, and how you treat others are far more important factors than what you do. Respectful, helpful, and collaborative relationships will open doors to new contacts, conversations, and opportunities. Just like the corporate sector, nonprofit organizations need IT professionals, database managers, facilities managers, and pretty much every other job description that one would find in the for-profit sector. So if you really want to help “feed the hungry,” it doesn’t necessarily mean soliciting donations or serving meals. The food bank needs accountants, too. Working with a board has unique challenges. By understanding as much about each board member as possible and developing those relationships, you’ll be able to more effectively create meaningful dialogue, effect change, and build committed leaders. For example, by knowing your incoming and sitting board members well, you can pair the newcomers with a “board buddy” whose personality will be a good fit for conversations and working-style. Every organization needs solid management with good people skills. The difference in the nonprofit world is the lack of hierarchy. To get people to do what you want, even when you’re not their boss, you’ll need to learn valuable skills of “managing up.” Additionally, keeping donors and volunteers coming back for more requires a different set of relationship management practices. People love to share their own organizational story to win over a prospective donor or volunteer, but that’s all wrong. People like talking about themselves, so to set yourself apart, focus on listening. By having a conversation where you do less of the talking and instead try and and look for ways you can help provide resources or help the person you’re talking to, you’ll demonstrate your value. Make a note about the conversation. Collect the person’s contact information. Assess how you can help this person or connect them with something or someone who can (even if it has NOTHING to do with your organization: they like marathon running and you just saw a coupon for 50% off running shoes, shoot them an email!). Now you’ve started a relationship. Maybe they’ll send a thank you response, and they’ll be more likely to RSVP “yes” to your next event — eventually you’ll win a supporter for the long haul. By casting the net wide, you have more likelihood for finding what your organization needs. Volunteering for a nonprofit organization is often front-of-mind when people speak with nonprofit employees. Don’t be afraid to test the waters for an in-kind gift and learn about driving participation. There are dozens of LinkedIn groups and Facebook groups for nonprofit professionals to network or find jobs. Or look for local MeetUps (or start one!) to build a community of people to share ideas with. One of the most recommended reading for fundraising professionals, Fundraising for Social Change by Kim Klein, is a must-read for anyone pursuing a career in this specialty. Once you’ve read Klein’s work, another way to keep your skills up to date is to join your regional Association for Fundraising Professionals. 20) Fundraising Is More Than "The Ask"
The moment where you give a desired donation amount, often called “the ask,” can be the hardest part of a fundraiser’s job. You’ve hosted the informational breakfast, touted the mission of your organization, proven your impact, and now you are putting a price tag on it. If you go to a large donor without laying the foundation for “the ask,” through proper prospecting, research, and effective presenting, you’re likely to come up short. As you build your network, support your organization and your team with solid research and lead management software to ensure you’re making the right asks to the right donors at the right time. There are instances where the donor and the ask come together in unexpected ways. Be prepared before each meeting or event with a strategy for making a donation request when the opportunity knocks. If you need help with your ask, here's a fantastic full guide on how to do it. From relationship building to relationship maintaining, the work of a fundraising professional is never done. If you need some help, here are eight great ways to better engage your donors. Whether it’s donors, board members, members, volunteers,, or others, a service mindset should always come first. Delivering stellar service, with sincerity, to everyone who interacts with your organization will work wonders for your organizational culture and personal mindset. You reap what you sow. Once you merge your personal drive with a best-fit organizational culture and focus, prepare for a boost in job satisfaction. Seeing the impact of your work helping others really does feel great. With all of these challenges, why do people keep pursuing careers in nonprofits? Because they’re totally worth it. Shawna's reflection also pairs nicely with that of another seasoned nonprofit professional. "Be prepared for resistance to change," and "The real reward isn't in the salary or accolades - it's in the work. The people you will work with are among the most wonderful individuals in the world. Be grateful for the opportunity to know and learn from them."